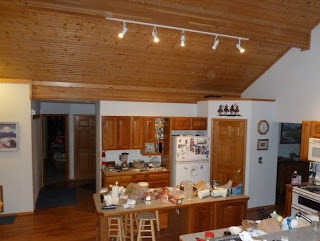 We decided to give LEDs a try for our overhead kitchen lights -- thought I would pass on what we learned since some of it was not what we expected. We had six overhead R30 track lights in the kitchen that we had converted from incandescents to CFLs sometime back. The CFLs worked out pretty well, but they did have a shorter life than you would expect from a CFL. This is probably because the lights are turned off and on a lot, and that is not good for CFL life. The lights are also very awkward to replace as the ceiling is 13 ft high, and its hard to get a ladder in the right place. These are also the most used lights in the house, so that seemed like a good place to start. Our new R20 track mounted LED lights. We found that getting the right LED is a bit more complicated that just buying a bulb used to be. The LEDs are expensive (as in $20 to $40 ish each), the quality is not yet consistent for all manufacturers (perhaps an understatement), and there are light quality and color issues that need to be understood. And, given that the lights may last the rest of your life, you will live with any mistakes for quite a while. The link below goes over all the details, but after some homework we were able to find a good LED for our situation, and we are very happy with the result. The LED we selected is an R20 (instead of the R30's we had). The new LED uses only 8 watts as compared to the 15 watt CFLs we had, which replaced the orginal 65 watt incandescents. We also found that we could eliminate one of the lights. So, we went from the original 390 watts in incandescents down to 90 watts of CFLS, and now 40 watts of LED lights -- quite a saving -- about 500 KWH a year and over 800 lbs of CO2 compared to the original incandescent lights. The R20, 8 watt LEDs we chose -- $22 each. And, the lighting is very nice. A definite improvement over the CFLs inspite of the fact that on paper the LEDs have substaintially less total lumen. In addition, the LEDs come on instantly, and I will never have to go up that ladder again! The link below goes into some of the issues involved in finding the right LED and in deciding which of your current lights might be good candidates for replacement, and figuring out the dollar and carbon saving. But, in a nutshell, it looks to us like at the current prices and performance the LEDs pay very well compared to incandescents, and also make sense as CFL replacements in some cases. Anyone have any interesting/helpful experiences in LEDs to pass on? Light trivia -- did you know that the "R" in R20 means its a reflector light, and that the "20" means that the light diameter is 20 eighths of an inch (2.5 inches)? An PAR38 is Parabolic Aluminized Reflector light that is 38*1/8 = 4.75 inches in diameter. An A19 is the traditional Edison household light bulb shape that is 19*1/8 = 2.4 inches in diameter. I'm glad to hear they are down to $22. I've been wanting to try them out, but replacing 15W CFL with an 8W LED hasn't all that compelling, except for your point about the life. The CFL's are really becoming cheap in both senses of the word. I have CFL's that I bought 15 years ago for some irrational price that are still working fine. With the newer CFL's, it seems like I'm replacing one or more every few weeks. Thanks for posting this. Great site by the way. I spend way too much time digging through all your material. I've about convinced myself to try your Water/Space heater concept that you just posted. I've really enjoyed the Cree cr-6 led potlight replacements that are available at Home Depot for about $50. BTW what is the color temperature of the R20 lights you've installed? The Crees have a good reputation -- it was another person who had used the Crees and was really happy with the results that got us started on this. The color temperature is 3000K. At first I thought that this was just a touch bluer than ideal, but after a few days I've come to like the slightly whiter light. Agree that if you have a place that a CFL will work well, and can get one that has a good life, that the CFLs still seem to make more economic sense than the LEDs. I think that we will concentrate on areas where the lights get turned off and on quite a bit, as I believe that this shortens CFL life quite a bit. For us, this turns out to be most of our lights, because we try to be good about not leaving lights on when they are not in use. We went with 12 volt MR-16 LED bulbs for our project. We still use some halogen MR-16 bulbs because the colour temperature is so much nicer than the cold blue lights of even the LEDs that are supposed to be "daylight" coloured. We found 12 volt MR-16 CFBs, but they don't seem to put out much light (too dispersed) and they don't start reliably on electronic transformers. We went with 12 volt with a goal of later conversion to 12 volt renewable power from solar, microhydro, or wind. The 120 VAC power supplies for the LED bulbs are a source of waste heat and inefficiency. LED lighting is still a very new phenomina... Give it time... the transformers are what make them expensive... Going from 120 VAC to 4 VDC is a bit of a trip. The price will come way down when we all get off the grid and hook use PV power directly.